Come light i continued to circle around Glendarragh, enjoying a brief encounter with two playful fox cubs. Despite the sunlight in the valley below mist was racing over the high ground, coming up from the Glencar side. I climbed up to the prominent point on the Gleniff side (725469 F) which is a subsidiary summit of Slievemore. This gave views steeply down into the valley from nearly 600m through the mist. The long ridge stretching out to Benwisken was well laid out from here, with Donegal Bay and the hills of Donegal providing the backdrop. There is a drop along the cliff edge and a slight rise to pt. 508m, then an easy stroll along the broad ridge itself. Pass an area of peat hags, pools of water and follow a vechile track through the grass beside a line of old bleached fence posts. 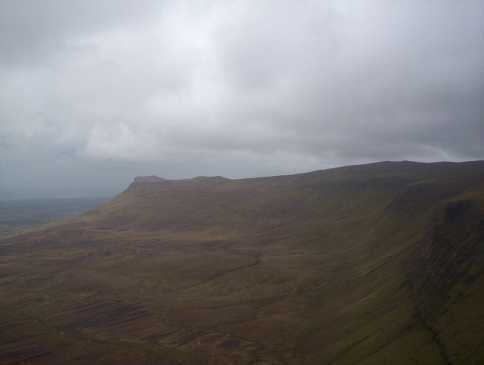 This walk is a joy with views to Benbulben to the west and Truskmore and Tievebaun to the east. The last bit of the hill (beyond the top) is fenced (with a pile of new posts and wire waiting to be erected). The fence can be followed to the edge for cracking views over the lowland below, across Donegal Bay and to most of the hills of the county, with the Bluestacks to the fore along with a cloud capped Slieve League and i am certain the Sperrin mtns. To the S i had Mayo in vision out towards Belmullet. 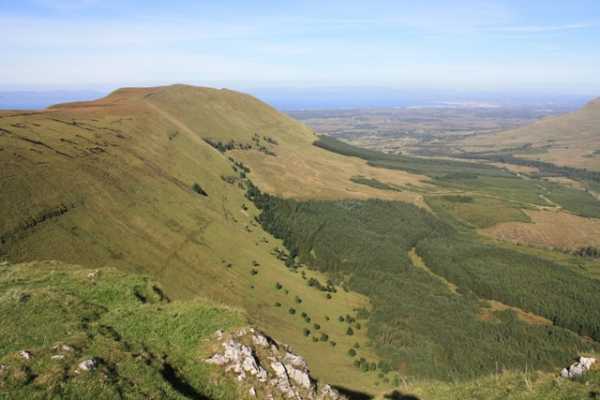 A lovely access to Benwiskin is to climb Benbulben from the Grange side and to walk across the mountain top (fairly flat) straight over to Benwiskin. 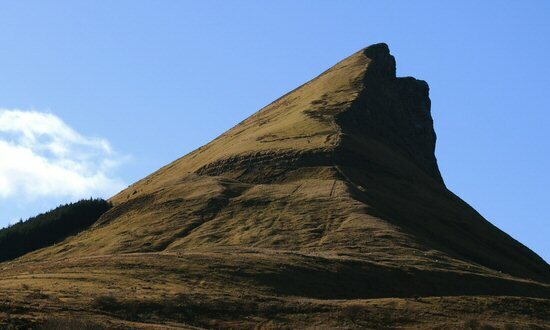 The climb up Ben Bulben takes about 1 hour and the walk across to the summit of Benwiskin about 1.5 hours. On a clear day (and one should be careful as the mist descends very quickly and frequently) the views in every direction are spectacular. As one nears the summit of Benwiskin, there is fencing on one side (Mr Bull's I presume) but the summit is fully accessible and thankfully the no trespassing sign which greeted me the first time I did this climb (about 1 year ago) is gone.